With the help of 86 pumping stations, approx. 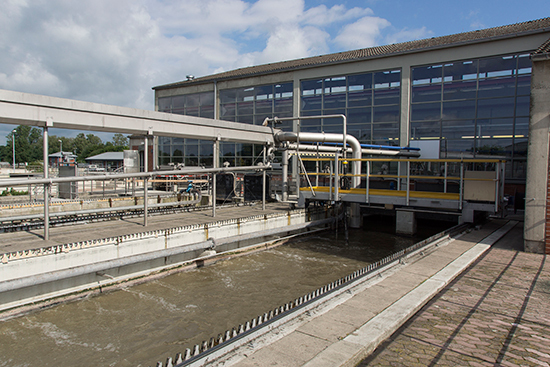 700 litres of waste water per second enter the waste water treatment plant Steinhof in order to be purified. This quantity equates to roughly the amount of tap water required for 100 consecutive toilet flushes. After being raised by spiral pumps to a height of 2.5 metres, the incoming water then flows on through the entire plant. The first station is the raking facility. The purification of the waste water begins here. All large solids such as paper, textiles or wood are extracted from the water and disposed of as waste. After the solids have been removed, the water flows slowly through the aerated sand and fat trap. At this point, stones and sand are deposited on the bottom. The accruing fat, which collects on the surface of the water, is transported to the digester for further processing. At the end of the sand and fat traps, the water flows through the primary clarifiers, in which organic material in the form of sludge (primary sludge) settles. The primary sludge is finely ground and pumped into the raw sludge reservoir. The biological purification begins in the mixing tank. 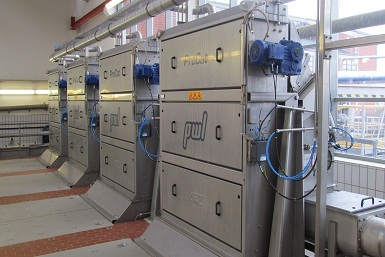 The mechanically pre-purified waste water is mixed with sludge from the secondary clarifier. The mixing tank serves as an anaerobic tank for biological phosphorous elimination. 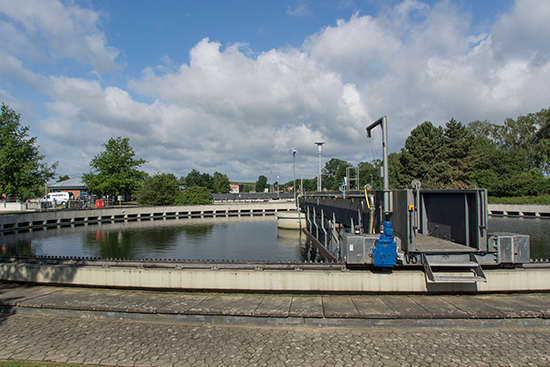 Via a channel, the waste water/sludge mixture is distributed into six activation tanks. In the activation tanks, an extensive decomposition of the carbon compounds occurs. 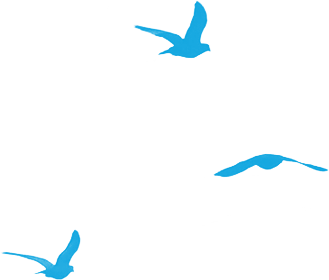 Simultaneously, nitrogen is removed and biological phosphorous elimination takes place with the help of micro-organisms. The oxygen required for the decomposition is fed in via surface aerators. 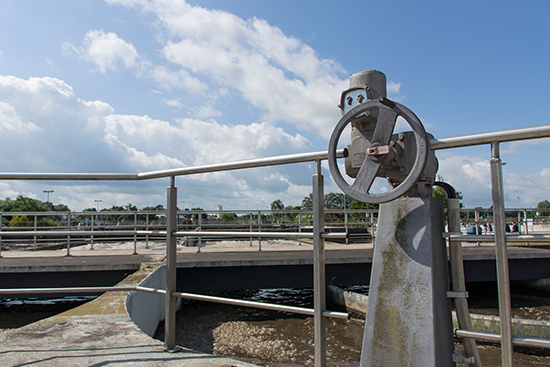 Following the biological treatment of the waste water, the sludge mixture passes through the distribution facility, where it is distributed among the four secondary clarifiers. 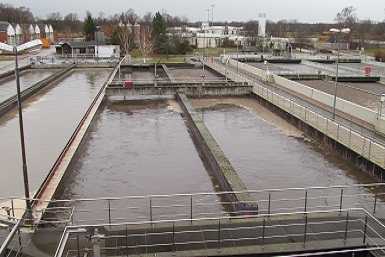 Through sedimentation, the activated sludge separates from the waste water. 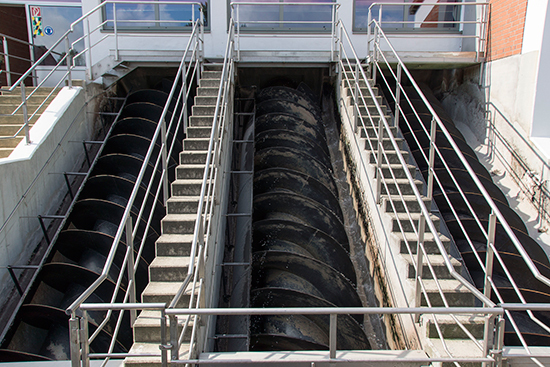 The clarified water flows over the tooth-edged thresholds of the secondary clarification tanks into the outlet channel. From here, it is pumped into the infiltration fields or the reservoir ponds or is used for irrigation.